Blinglet has developed Hollyscoop mobile, one of the hottest entertainment news networks on the web, is now available on your iPhone or iPod Touch. Want to know what hot spots your favorite (or not so favorite) celebrities are visiting? We got the scoop on that too! You can click through our daily photo galleries and catch up on your favorite stars. Updated around the clock, Hollyscoop brings you the latest celebrity gossip, up-to-minute breaking news, exclusive stories and interviews directly from the source. 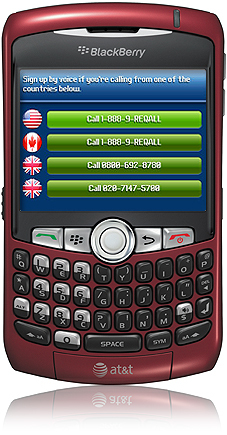 reQall for BlackBerry gives you a voice-to-text recorder, task/shopping list/idea manager, reminder service and memory aid all in one. Turn your BlackBerry smartphone into a powerful productivity center that helps you remember all the important things in your life. Beta version available now! Go to http://www.reqall.com/blackberry on your BlackBerry to download the application. Note: reQall for BlackBerry requires OS version 4.2.0 or higher.